We have made a terrible mistake about what human nature is. We are under the misapprehension that we're born bad, or in the official words of the Church of England, innately depraved, and that is simply not true. I was living for more than two years with these Indians, looking straight at them and not really seeing them, because I was so blinded by preconceptions. I didn't even notice that, amazingly, the children never fought. They played together all day unsupervised, all ages, from crawling, to walking to adolescence. Not only did they not fight, they never even argued. This is not at all what we have been taught human nature is-boys will be boys. So I thought, "well maybe, boys won't be boys." One thinks these are savages. They wear red paint and father loincloths, so they're not people. But they're exactly the same species as we are, except they are behaving the way we all evolved to behave. We, on the other hand, are mistreated as infants and children, treated inappropriately for our species. As a result, we keep re-creating an anti-social population. Nobody's born rotten. You just don't have bad kids. It's not true. There is no such thing. But we can make them bad. Just imagine the neurotic and psychopathic people that we have become. Why do we have a 70% divorce rate? Why do we have so many police? It's not just Americans; it's the whole of western civilization laboring under a misapprehension of what human nature truly is. That's what I learned from my experiences. Children, three, four and five year olds would carry babies around all day. No one was saying, "Sit here and you can hold the baby while you're sitting down," or, "Watch out." Very small children are trusted to take care of infants because five minutes ago they were babies themselves. They just know how to take care of babies. Here we are, great big grown-up louts in our twenties or thirties reading books about how to take care of babies. I'd be embarrassed to admit to the Indians that our women don't know how to take care of their children until they read instructions written in a book by a man, a man they've never met. The Indians wouldn't have any respect for me. If you were there, you wouldn't either. In the jungle every man, every woman, every child knows how to take care of babies. I don't mean to be disrespectful to our experts. They may be able to distinguish a measles from a mump, which is very useful if you have one or the other. But that doesn't, for one minute, give them deep knowledge of correct human behavior. We use the word normal as though it were a synonym for natural, which it is not. Normal is how we think children must be. This includes things like three-month colic, where babies are constantly vomiting. They call it spitting up so it doesn't sound like a real illness, but it is an illness. It's painful. This happens even when babies are drinking their mother's milk. They're throwing up. There are contractions and a lot of pain. How can we believe that we alone evolved over millions of years without being able to digest our own mother's milk? Why are normal babies so stressed that they can't keep their food down? The babies I saw in the jungle never had indigestion unless they were ill with a fever. Babies never threw up. They were not wriggling and struggling and arching and flexing and squeaking like ours do normally. 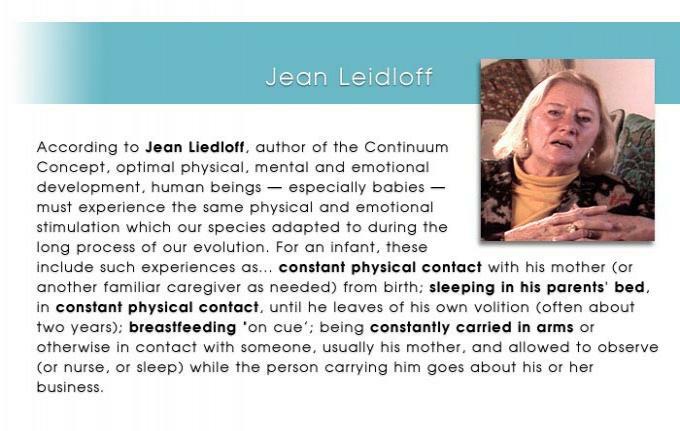 What the baby needs is to be in its mother's arms, and the mother even more so needs to have the baby in her arms to share this beautiful moment of falling in love, which is exquisitely choreographed by hormones. Today normal is adversarial. The baby arrives and has an innate expectation that it will be among trustworthy allies. That's not what happens. "Whatever I want, they say no. I want to be with my mother. I want to be close. I want to be safe. I want to be with someone alive, who's breathing and warm and smells right and feels right and who touches me and helps me feel my own flesh appropriately, not a lifeless box with a lifeless cloth. I don't want to hear myself screaming in my own ears, and hear other people screaming around me and get no response. When I scream I expect something to happen. Not just to scream but because I'm waiting. I'm expecting something and it doesn't come and I scream until I'm exhausted."